When you can’t garden, at least there’s bread! Awesome!! 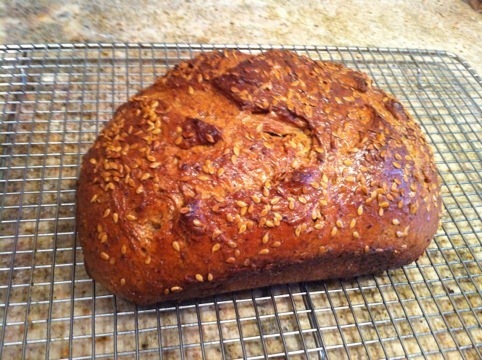 A good fresh hot bread is one of my weaknesses- winter… summer… spring… or fall! Great job on browning it. At least by me, the section of the store they call a ‘bakery’ produces pale white bagels and bread. What are they thinking? I can’t tell from the picture, but if you are not baking gluten free try a loaf with semolina flour. It gives the bread a slight yellow color when cut, has a nice texture, and tastes great. Semolina makes a great fresh pasta too. I kind of recall needing more yeast with semolina. I used to buy it loose from Sahadi’s, but you should be able to find it elsewhere. Most of my fresh bread now days comes out of a bread machine. It’s better than store bought- but it’s not as good as oven made. I used to experiment with sour dough bread. I got some acceptable loafs but never a really good one. When I got too much starter I would usually add it to pancake batter. The hardest part is getting a good starter going and maintaining it. I should have ordered some or tried getting some from a bakery, but I tried making my own instead. Some of it turned out so acid it probably cleaned the pipes going down the drain. I think it was from the movie ‘Apocalypse Now’ – “I love the smell of fresh bread in the morning”.